This is the return of the original Poetic Bloomings — the blog established in 2011 by poets Marie Elena Good and Walter J. Wojtanik, after their first participation in The Writer’s Digest’s Poetic Asides April Poem-A-Day (PAD) Challenge in 2009. Meant as a means to stay connected while continuing to hone our skills collectively, it has been a place where creativity grows and flourishes in a supportive and encouraging environment. Please join us each Sunday for our prompts and examples, and possibly the highlight of various poetic forms. 1. HAVE FUN. The guidelines aren’t meant to be restrictive. They are just to try to keep everyone on the same page. As with any poetic blog, the key point is to write! It is all about the process of writing poetry. If it is poetic, we will celebrate it here! 2. “SUNDAY SEED.” Every Sunday, we will post a new prompt. You may post your poems at any time throughout the week(s) ahead. We hope that you try to keep to the prompt. It makes it easier to categorize the subject matter. But we are about the process here. So as long as you’re writing, we’re all better for it! 3. HOW TO POST. Poems may be posted in the COMMENTS section for each prompt. You may also post to your personal blog and leave a link to your poem in your COMMENT. Better yet, write your poem in the comments AND include the link to your site at the end (in case you include photographs or other modalities to enhance your words). We’d like to see what you’ve got brewing. 4. WHO MAY POST? 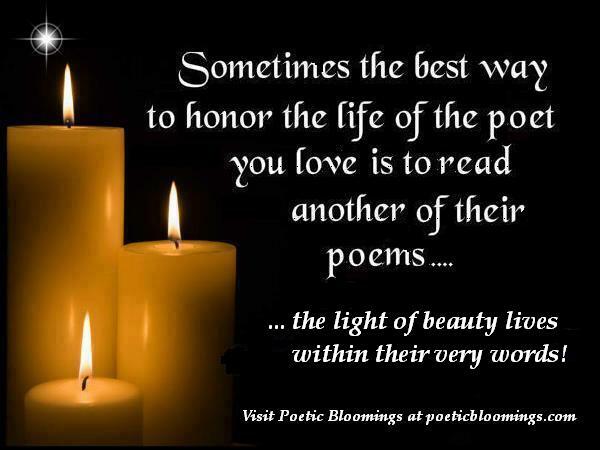 Poetic Bloomings is open to all poets, regardless of skill level, point of view, or age. As such, we encourage members to “be mindful of this when posting.” Our goal is to encourage and learn from one another. Hopefully we’ll all gain a fresh understanding of the creative process. 5. “WILD CARD.” We will have the occasional “WILD CARD” prompt to allow you to let your muse loose. 6. POET INTERVIEWS. Also in the past, we had featured one of our Poetic Bloomings members, or other special guest in an impromptu interview. This includes samples of their work, advice, photo, etc. We will occasionally update past interviews and celebrate new contributors to PB. 7. “INFORM POETS .” Also on occasion, we will feature a poetic form for your consideration and information. (More of a tutorial for some of the lesser known or invented forms). We encourage you to try your hand at these forms, although you are not under any obligation to do so. 8. “DAISY CHAIN.” Please provide a link to your blog for our “DAISY CHAIN.” We are about promoting your work and this will serve as our continued “directory”. You retain the rights to all your poems — we just wish to help give you another venue for exposure. Links may be e-mailed to Walt at poeticbloomings@yahoo.com. 9. “BOOK SHELF.” Let us know if you have been published, and flaunt it here. We encourage success. If you have a collection or chapbook available, allow us to post it on our “BOOK SHELF” with your link to acquire said publication for all who may be interested. 10. BLOG HOPPING. We encourage you to visit the blogs of other poets and contributors regularly. Leave constructive and supportive comments. We want to nurture the expression of these creative works. Common courtesy would be nice; that’s how we build this community! 11. QUESTIONS may be directed to our e-mail: poeticbloomings@yahoo.com . Any updates will be highlighted under that banner. We would like to re-establish a community of poets working for a common goal: the propagation of all things poetic. Plant your creativity seeds here, and allow them to bloom in our garden. We look forward to your contributions to the creative process! I haven’t been receiving notice from you about calls for poems. I wonder why. Sal, perhaps you haven’t signed back up when we switched from blogger to wordpress. Actually, most of our “members” haven’t signed back up. To be sure, hit the little “follow” icon in the lower right corner of your screen. It will tell you what to do. If that does not help, please let us know. We’ll try to figure it out. Very nice blog. I look forward to becoming familiar with it in the next coming weeks. Cheers! I’ve been so “taken” with photography that I have not been attending to my poetry. I would love to begin again. This is a beautiful blog site you all have created. I’ll be looking back as I get time between writing and commenting to the new prompts. WOW !! Glad I found Poetic Bloomings again today. Hello, Mina and Jane! The addition of your voices is most welcome! thank you for your welcome – pleased to be writing again and have such a tireless group to write with. What a beautiful place! I am so glad to be apart of it. Welcome, Jenn! Join in the fun! Holy Mackerel! What’s up guys??? I’ve missed you all SO MUCH! Sooooooooooo glad you found us again, Benjamin!